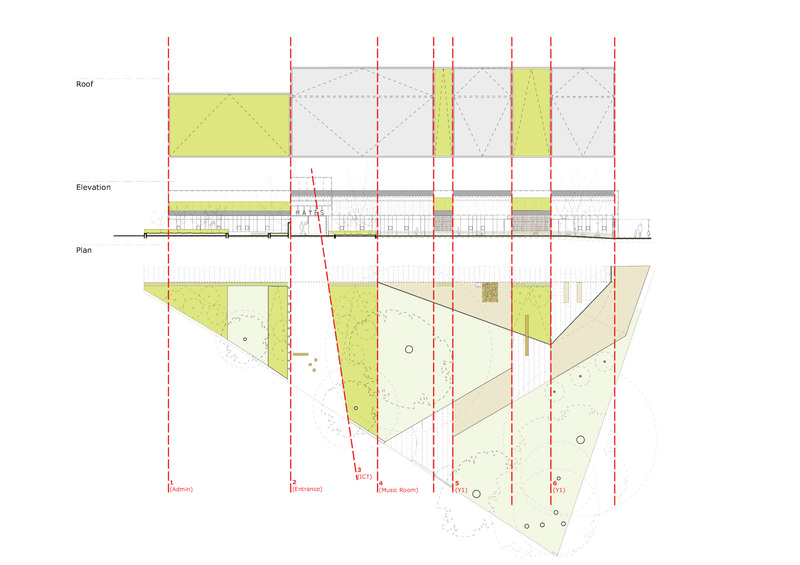 Hayes Primary School - Hayhurst and Co. 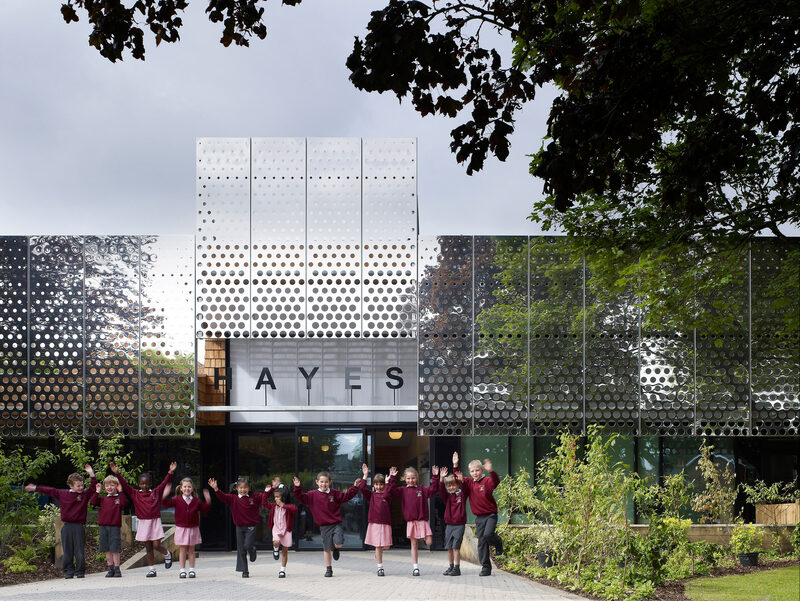 The expansion of Hayes Primary School provides an exciting and vibrant new extension to a tired and out-dated school building; an extension that flickers and glimmers with the reflection of the adjacent trees providing a renewed energy to a building at the heart of its community. 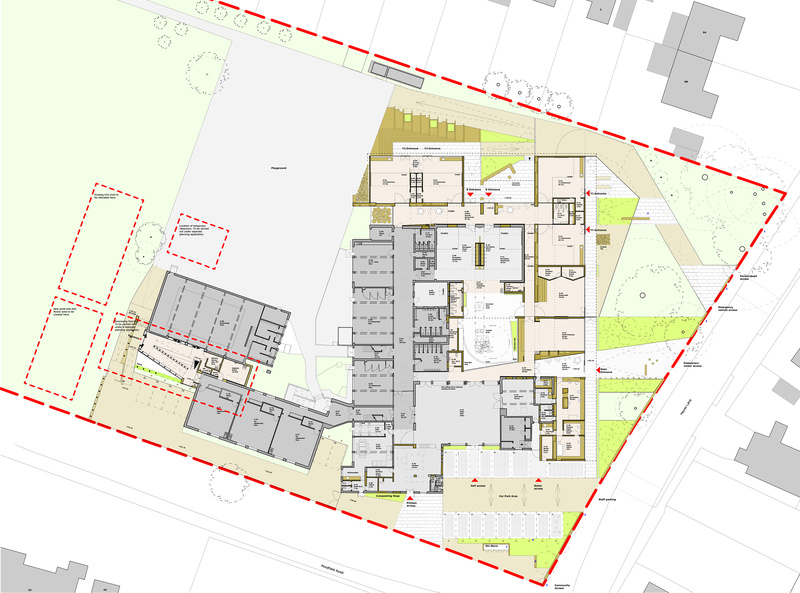 The new accommodation is located at the front of the school site providing the opportunity to create the appearance of a new school. 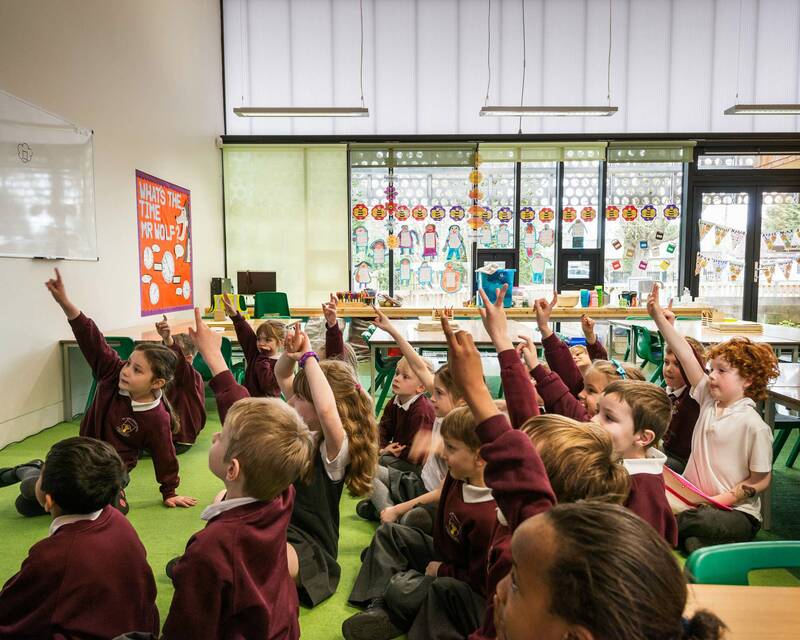 The extension provides new accommodation for an additional 105 pupil spaces, comprising 4 new infant classrooms, ICT Lab, a small hall and new administration facilities. 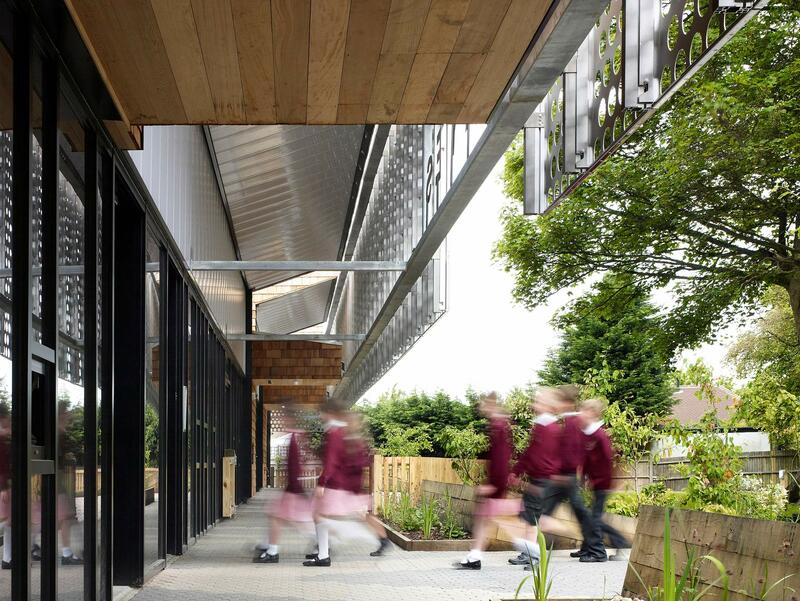 The project also relocated the previous car parking and created a number of new external play and learning spaces and a new landscaped space at the front of the school site. 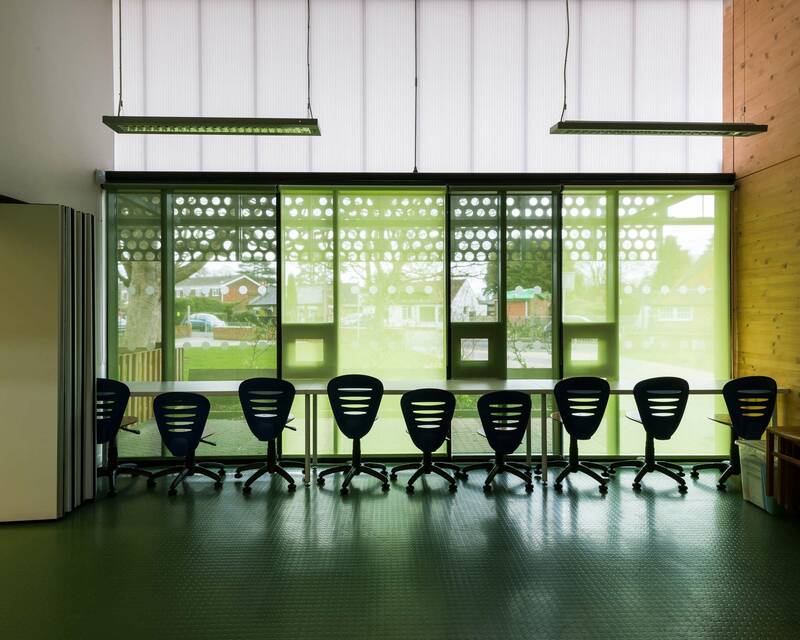 The new accommodation opened in doors to pupils in September 2012. 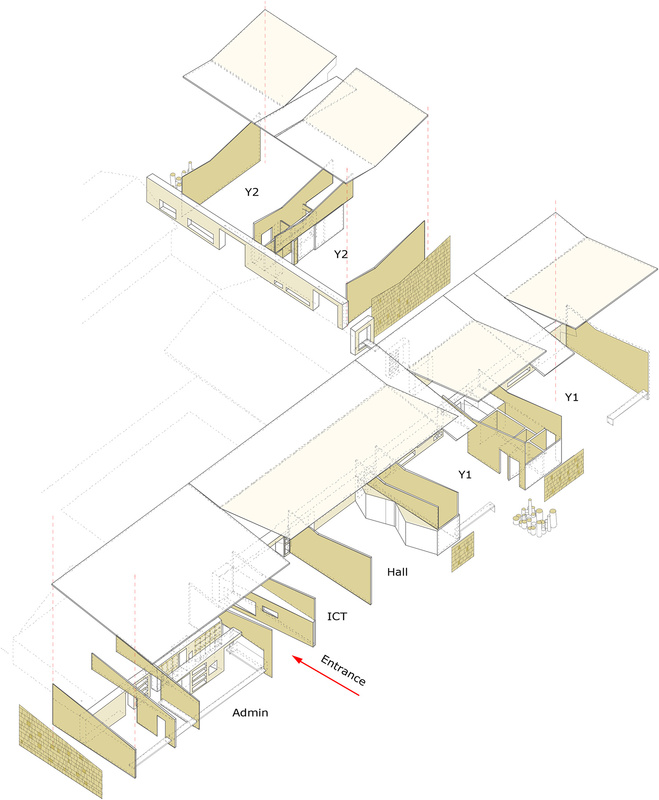 The new landscape areas leading up to the building was designed to be an integrated and stimulating learning environment. 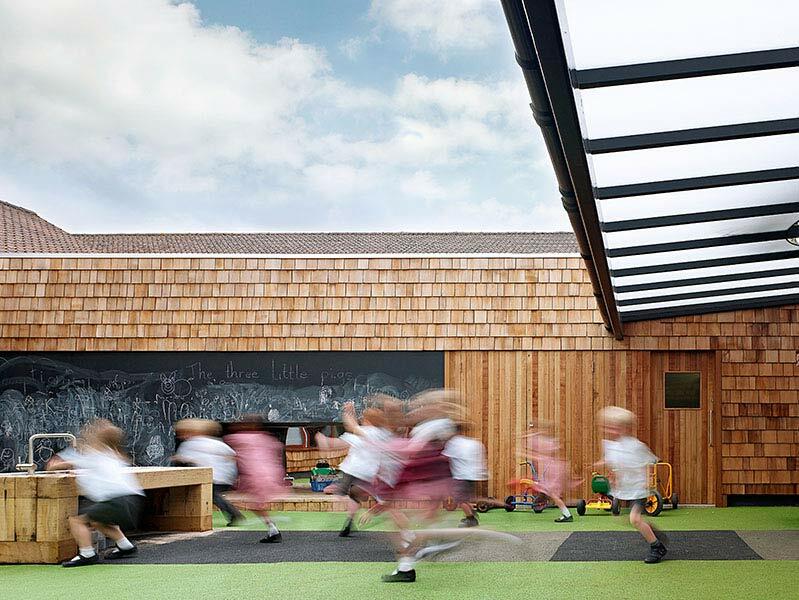 Each of the new infant classrooms has its own outside space under the canopy of the projecting roof to create an outdoor classroom. 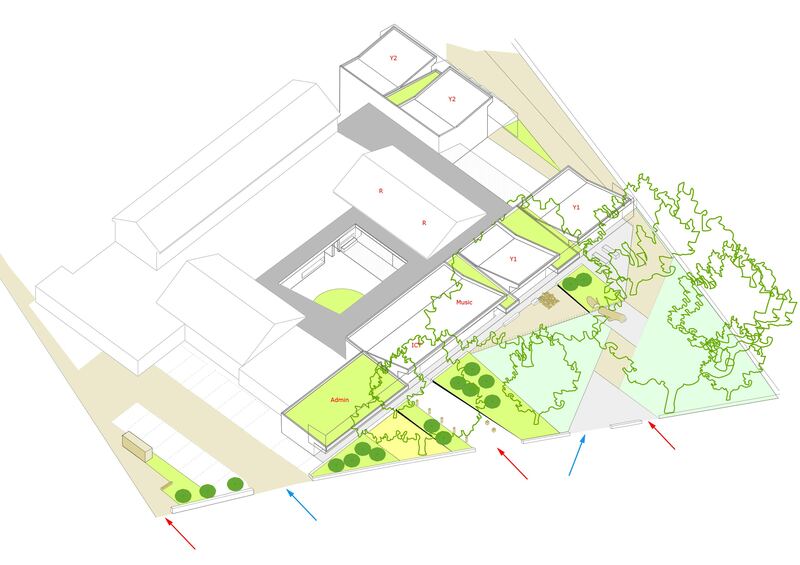 The flat ground to the front of the site is articulated by raised timber banks formed out of oak sleepers that rise up to the building to form planting beds for waterborne plants that collect rainwater run-off from the roof acting as a sustainable means of drainage. 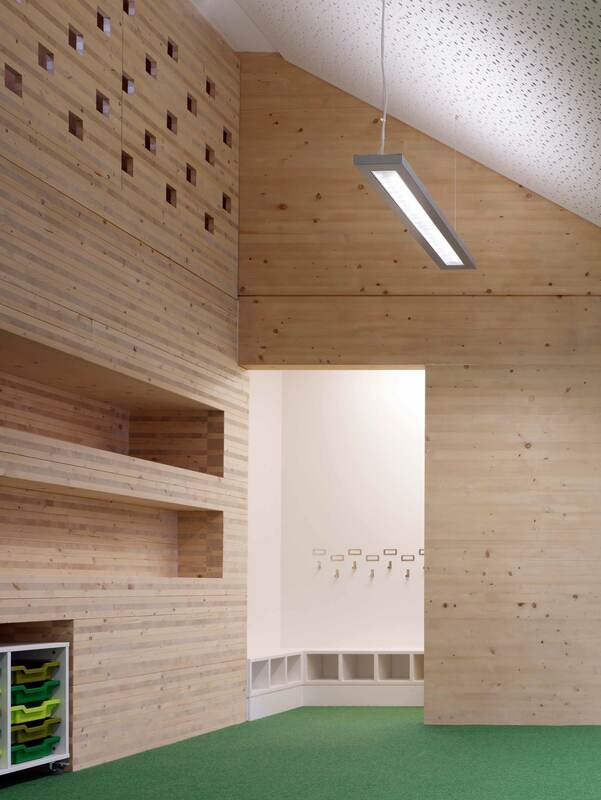 In recognition of the fact that a number of trees had to be removed to create the new extension, the building’s structure uses an engineered, cross-laminated timber system. 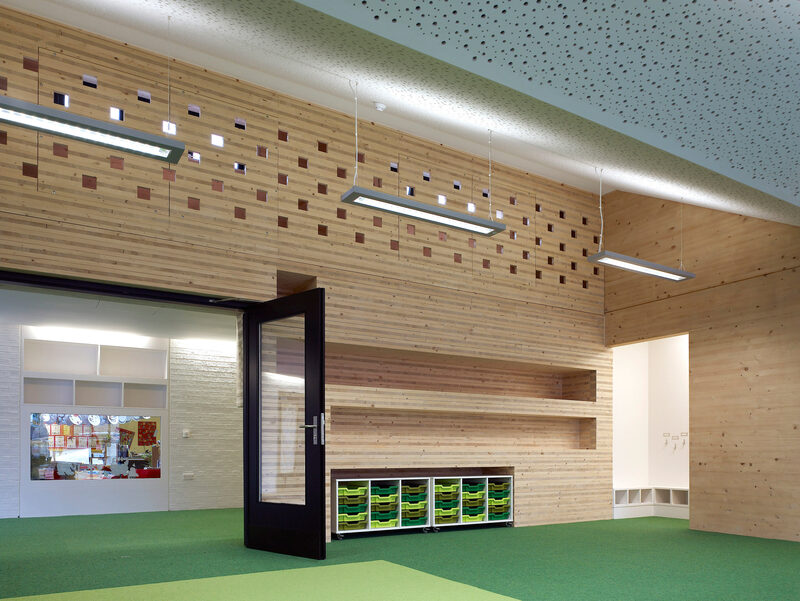 This material is also used to form a central storage wall that runs through the new school: a 650mm thick wall, made up from horizontally stacked timber panels that give an internal elevation of exposed timber end-grains. 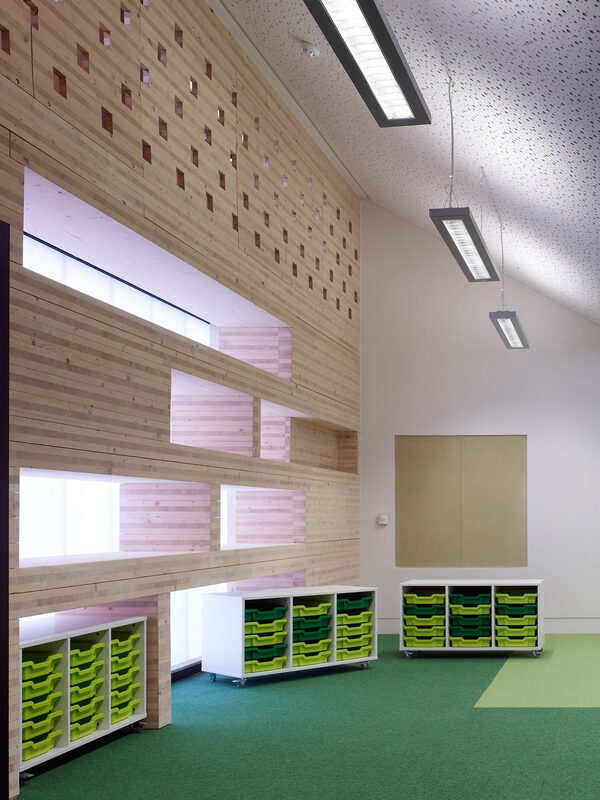 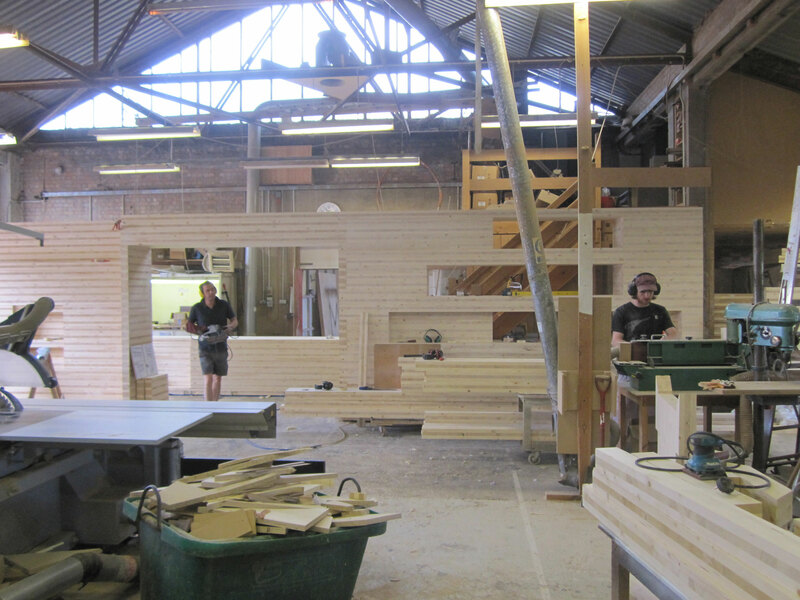 The solid-timber pieces are cut and stacked to form openings in the wall, through to the classrooms, and with recesses on alternating sides that form shelves for the school library, seats and reading alcoves as well as storage for classroom equipment and teaching materials. 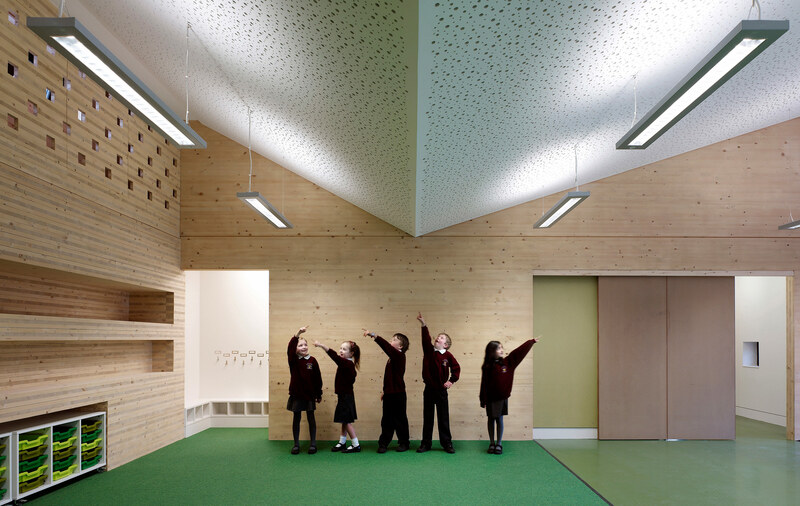 When stacked and biscuit-jointed, the end grain of the pre-fabricated element appears as a substantial and solid core at the centre of the school. 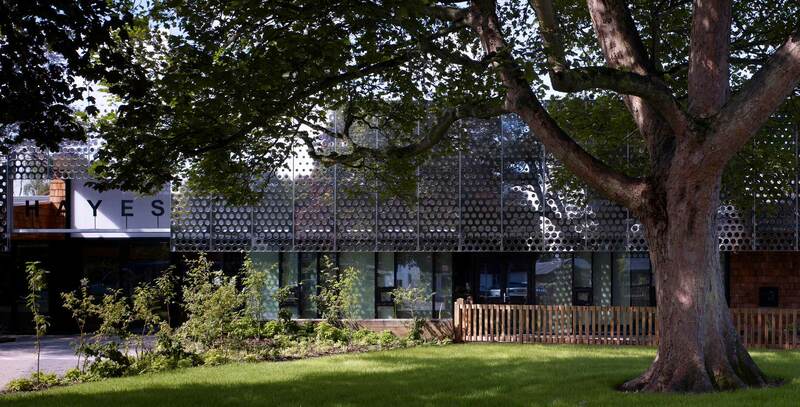 The main façade of the building has a reflective steel brise-soleil that provides shade from solar glare and over-heating to the teaching spaces as well as giving a uniformed building elevation. 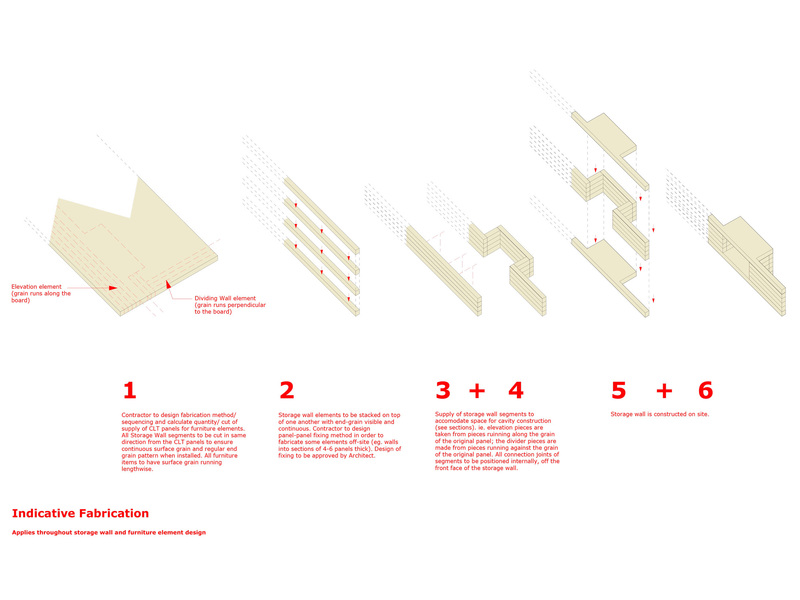 The perforations vary in size: larger at the bottom to let light in and gradually getting smaller to the top to allow for a greater level of reflection. 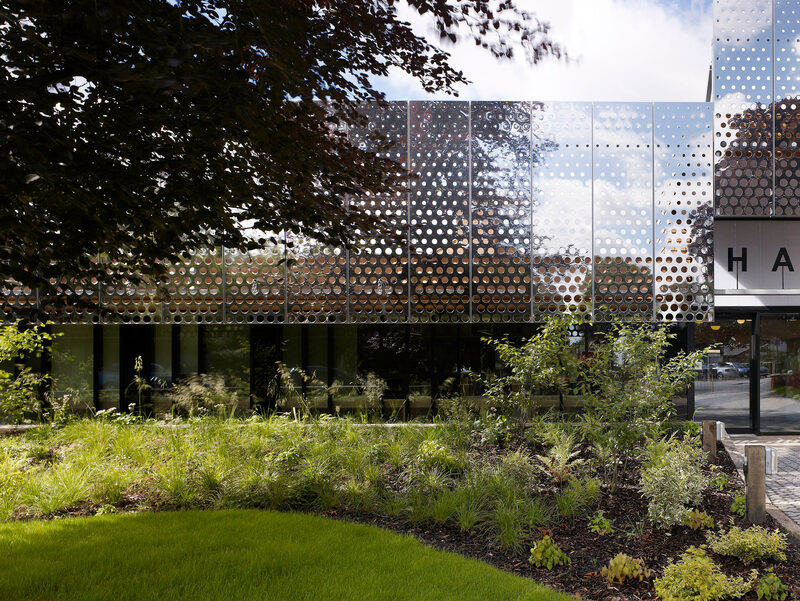 This mirror-finished screen, positioned at high-level on the building’s façade, reflects the canopies of the mature trees at the front of the school site, giving the illusion that the mass of the building is reduced. 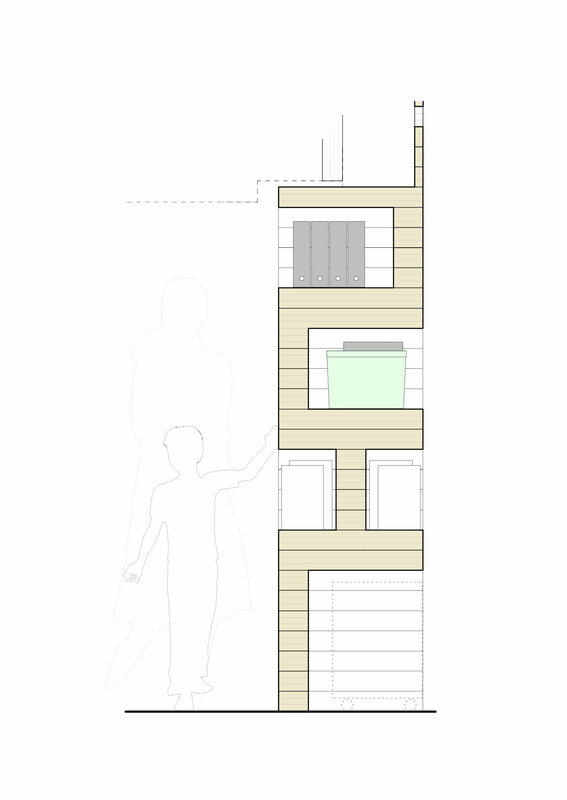 Walking or driving past the building gives the sense of a dynamic elevation: a variable, enlivening and visually-engaging elevation.